On Saturday, October 13th, we will be combining football and beer by releasing #99 our touchdown collaboration with Pro Football Hall of Famer, Warren Sapp! The kickoff for this beer will feature a special appearance by Warren Sapp himself, who will be signing bottles and taking photos. 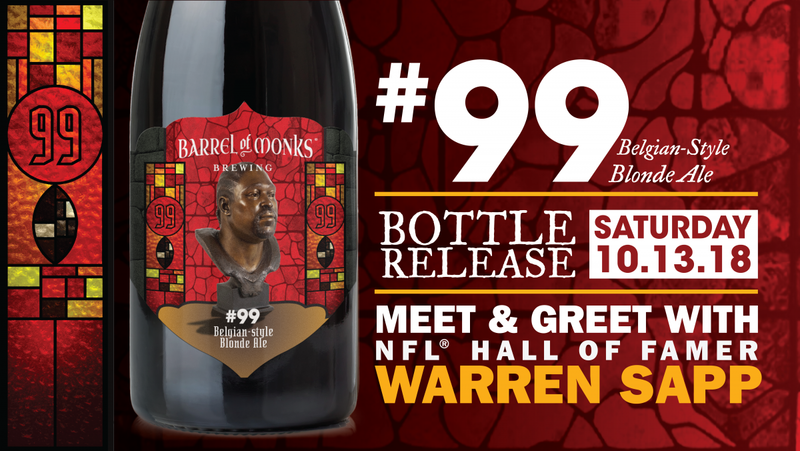 From 1pm-4pm, the Super Bowl champion and Barrel of Monks will be selling #99 as a limited release in a champagne-style 750ml bottle adorned with a label showcasing Sapp’s Pro Football Hall of Fame bust. #99 is a hoppy Belgian-style blonde ale with lots of citrusy hops added in the whirlpool and then heavily dry hopped. This creates a rich aroma and flavor profile without excessive bitterness. These flavors blend nicely with the fruity notes from the Belgian yeast strain to make a delicious brew. If you are a football fan or a beer fan, you won’t want to miss this!